Hemiplegia is paralysis of one side of the body. Hemiparesis is weakness of one side of the body and is less severe than hemiplegia. Both are a common side effect of stroke or cerebrovascular accident. 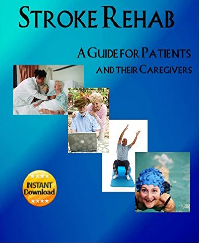 One may wonder how only one side of the body can become paralyzed or weak after a stroke. One sided paralysis or weakness occurs when a stroke affects the corticospinal tract of one side of the brain. The right side of the brain controls the motor function of the left side of the body. The left side of the brain controls the motor function of the right side of the body. Thus when one side of the brain is damaged, it causes only one side of the body to be affected. 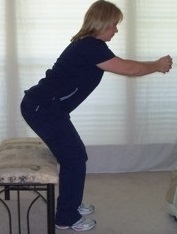 Range of Motion - Moving the paralyzed or weak limb or extremity can help prevent stiffness and muscle contractures. Range of motion can be passive, active-assistive, or active depending if the extremity or limb can voluntarily produce any movement or if it has to be moved by an external factor such as a caregiver. View passive range of motion exercises you can do yourself at www.stroke-rehab.com/passive-range-of-motion.html or view exercises the caregiver can do for the patient at www.stroke-rehab.com/stroke-rehab-exercises.html under the passive range of motion section. When lying on your back, place a pillow by your side (parallel to your body) and place the weak arm out straight on the pillow. If there is edema in the hand, you can use an extra pillow to elevate the hand to decrease swelling. When lying on your non-affected side, support the weak arm and leg on pillows in front of the body. If lying on the weak side, just make sure the affected shoulder is slightly forward and that you are not lying directly on the shoulder joint. Compensatory Techniques - One may have to use compensatory techniques to overcome problems caused by hemiplegia. Adaptive equipment is available to make mobility and ADLs easier. Examples of adaptive equipment include hemi-walkers, bathroom transfer benches, raised toilets, dressing aids, and more. Adaptive clothing is also available to stroke patients to allow for easy fastening, removal, and even changing clothing entirely from a seated position.